This scarf has been long sent off, but I have been out of town for the last couple of weeks, which has kept me from posting. Man, am I happy to be home! At the beginning of January, I ordered yarn to make Danica for the Red Scarf Project. By the middle of January, still no yarn. I am convinced that the mail was so slow due to the great freeze of 2007, during which it did not freeze in my area, but everything shut down. I decided to take matters into my own hands and went to the local craft store to get some yarn that would work. I picked up the only acrylic I can tolerate (as I wanted it to be washable) and got to work. Luckily, I completed this scarf in about a week, just in time to send off. It went pretty quickly because it was just a series of squares, and it’s much easier to wrap my head around doing a few squares at a time then it is to do several rows. 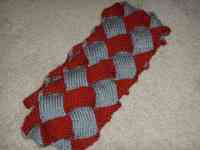 I really enjoyed my first attempt at entrelac and hope that the student who receives my scarf enjoys wearing it. And, now I have some yarn that was originally ordered for this scarf to use for something else. This is a big week for us, as today I am 20 weeks along and on Tuesday we will find out if the little beast is a boy or a girl! I am SO ready to know so that I can get to knitting baby things and get going on the baby quilt. I’ll share the news with you as soon as I have an opportunity on Tuesday or Wednesday. Congratulations on reaching the halfway mark! I’m sure the ultrasound will be exciting for y’all! Great job on the entrelac – the scarf is beautiful! yeah 20 weeks! i feel like that was SO long ago for me 🙂 i’m almost ready to pop at 36 weeks! Hope all is well and the babe lets you know for sure. Love the scarf! Hooray! Can’t wait to hear. Also? Belly pics! Please?